For many among the 12-14% of the general population who, according to Dr. Nicholas Shammas of the Midwest Cardiovascular Research Foundation, suffer from peripheral arterial disease (PAD), surgery may be best option for restoring circulation to the legs (as per the study entitled “Epidemiology, classification, and modifiable risk factors of peripheral arterial disease’, published in the April 2007 edition of the Journal of Vascular Health and Risk Management). The rising cost of this procedure, however, has made travel for femoropopliteal surgery abroad an attractive solution for many American, Australian, and UK citizens. Femoropopliteal bypass (also known as fem-pop, femoral popliteal or femorodistalbypass), is used to treat blockages of the femoral and popliteal arteries in the leg. Blockage of the femoral or popliteal artery (atherosclerosis) is a common symptom of peripheral arterial disease, and, if left untreated, can cause symptoms ranging from intermittent pain and ulcers to gangrene requiring amputation. Surgical treatment involves the construction of a bypass around the blocked artery. Using either a transplanted vein from the patient’s body or a prosthetic graft, the surgeon re-routes the flow of blood around the blockage. Patients with severe PAD may require surgery as soon as possible to prevent complications; for this reason, shorter wait times for femoropopliteal and femorodistal bypass in India and elsewhere are causing many patients to seek treatment abroad. Patients who travel for femoropopliteal bypass treatment in India often find facilities and staff comparable to those in the United States, Canada or the UK. Indian hospitals are generally modern and clean, and benefit from the country’s investment in healthcare technology. While the cost of travel for a femoropopliteal bypass in India from the United States or Canada can be high, this is offset by considerable savings on the procedure. Prices vary by facility, but on average femoropopliteal peripheral bypass surgery in India can cost up to 50% less than in Western countries. The price of Femoropopliteal bypass in India reflects the country’s lower cost of living and significant investment in its healthcare infrastructure. According to an Al Jazeera report by Jagpreeet Luthra published on 18 June, 2006, India’s hospitals boast “first world medical care at third world prices”. Furthermore, patients who travel for a femoropopliteal graft in India have the opportunity to combine the procedure with an exciting vacation to one of the world’s most unique countries. India’s mammoth population of 1.2 billion is spread among megacities and starkly rural areas. 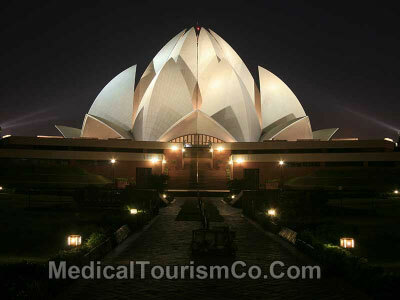 Most medical tourists will have their procedure done in urban centers such as Mumbai, Bangalore, or Delhi. India’s currency is the rupee (Rs); many places will not accept credit card or traveler’s checks, so be sure to have enough cash on hand when you travel. Temperatures in India during the summer months (roughly March-June) regularly top 100°F, so be sure to limit your time in the sun to prevent heatstroke. Additionally, the monsoon season, which lasts from June to September, brings heavy rains, so pack accordingly. Popular tourist destinations include the world famous Taj Mahal in Agra, the beaches and historical architecture of Goa, and the forts and monuments of the “pink city,” Jaipur. How are you? – kaise hay aap? How much is this? – ye kitne ka hay? Femoropopliteal bypass in India is a viable option for patients needing immediate surgical correction of peripheral arterial disease or atherosclerosis. Lower costs and wait times, and the opportunity to visit a unique tourist destination have made medical tourism in India popular among Americans, Brits, and other Europeans alike. 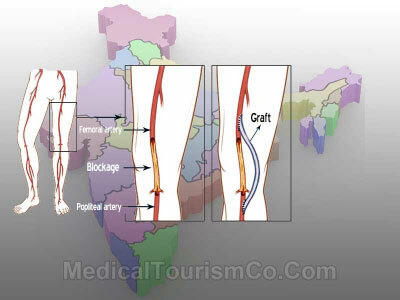 Medical Tourism Co. facilitates low-cost femoropopliteal bypass in India. For more information fill-out the estimate-request form.